Fall Bucket List Family Guide for the Best Autumn Ever! The Fall is one of the best times of year to get outside to enjoy natures seasonal sights. We have created a fall bucket list full of fun fall activities and awesome autumn crafts that kids and families LOVE! The gorgeous array of colors, delicious smells, crisp cool temperatures, all make the fall an enjoyable time of year. Find a few classic fall activities and maybe a few new ideas to try below. Remember this is not a must-do list, but a can-do list… If it’s not fun don’t do it! Choose the activities that you and your family would like to do this autumn and ditch the rest! Have fun checking off some of these classic fall activities with the kids for the best autumn ever! Learn more about each fall activity by clicking on the blue hyperlinked text within each suggestion. We have a few fun ideas for scavenger hunts in the fall. One of our favorites is searching for the signs of autumn appearing all around us as the seasons begin to change. It’s become a game that my daughter and I play as each season turns into the next. Another fun idea is to go out in search of colors or shapes like hearts. My daughter and I see hearts everywhere we go in nature and have created a beautiful video of them all that you can see in our heart shaped nature scavenger hunt. Have you ever made a sensory bin with natural materials? Go on nature sensory bin scavenger hunt this autumn with the kids to make your own, or make a nature sensory card! If you go out on a scavenger or nature hunt this autumn, collect some nature crafting materials too! Collect acorns to make acorn marble necklaces, and leaves to make leaf art, turkey leaf lanterns for Thanksgiving or heart leaf mason jars just for fun! If you find leaves that are sturdy enough, like magnolia leaves, use them for leaf lacing or sewing practice, or press and preserve autumn leaves to use later. 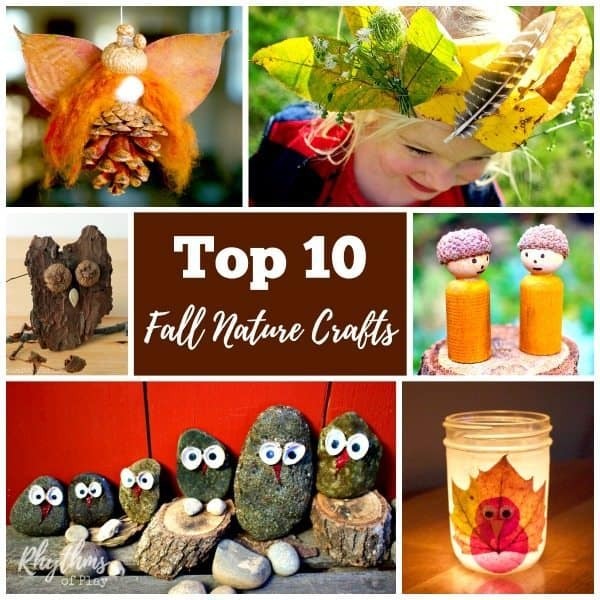 For even more fall nature craft ideas click on the link! The autumnal equinox marks the official beginning of fall in the northern hemisphere. Learn all about the fall equinox and fun ways to celebrate the beginning of this glorious season. Just click the link! Going to a pumpkin patch to pick out pumpkins is a classic fall activity for kids and families. We are lucky enough to live in an area where we can visit a new pumpkin patch every year, but of course, we have our favorites. Click on the link for all of our pumpkin patch field trip ideas including pumpkin carving ideas! May pumpkin patches have a corn maze, while some are separate. Find a corn maze near you and get lost with the whole family! Another fun fall activity to do with the whole family (or class) is to go to the apple orchard to collect apples to use for crafting and baking. Check out our apple orchard field trip ideas for all of our favorite apple activities, apple crafts, and apple recipes to enjoy the fruits of your labors! Pumpkin carving is a classic fall activity for the whole family to enjoy! Check out our pumpkin carving tips and ideas in pumpkin patch ideas and fall nature crafts. The fall is a great time of year to have a bonfire. Many people celebrate the autumn equinox and the changing seasons by having a bonfire. Find our favorite tips to have a fun and safe night in bonfire ideas for kids and families. My daughter and I love taking our cameras on hikes and nature walks. The autumn is an especially lovely time of year to get outside with a camera . Get outside and take pictures of all the amazing fall colors and natures seasonal sights! Whether you celebrate Thanksgiving in the autumn or not, the fall is a great time of year to make a thankful tree. Our daughter loves decorating trees so much we make one for every season. A Christmas tree in the winter, an Easter Tree in the spring, a butterfly tree in the summer, and a thankful tree in the fall. We have made both a thankful tree with real autumn leaves and a thankful tree with clay gratitude leaves. Make your favorite this fall! The autumn just wouldn’t be complete without at least one romp in the leaves. 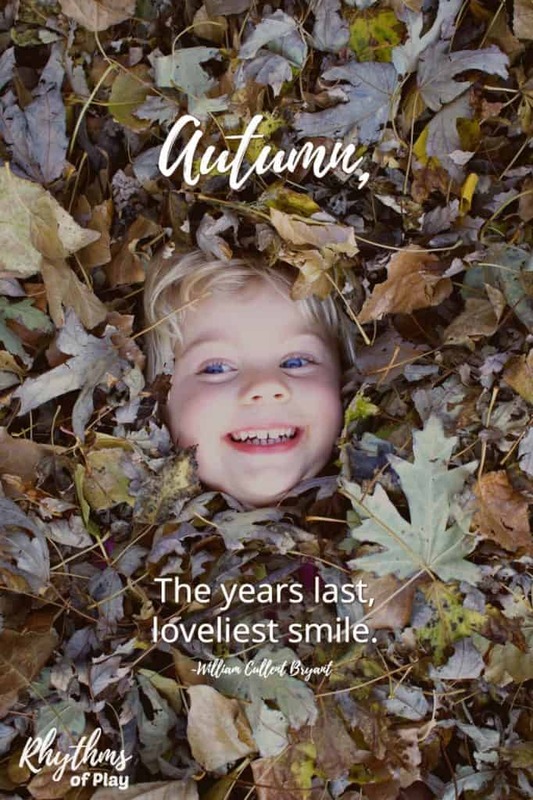 Our family loves to jump in the leaves, count and catch falling leaves and we have a whole slew of other fun ways to play in fall leaves that the whole family can enjoy. Who doesn’t love baking with pumpkin in the fall? Pumpkin pies and pumpkin bread are two of the most classic pumpkin recipes, but you can use homemade pumpkin puree to make all kinds of pumpkin treats. Have you ever made pumpkin puree from scratch? It’s super easy and adds a fresh taste to your baked goods that you just can’t get out of a can. My family’s favorite pumpkin recipe is pumpkin cranberry bread. Try it today! I guarantee your family will clamor for its tangy sweet goodness every year just like mine does! A nature table is an area in the home dedicated to nature and the natural world. Items collected in nature or natural items that represent nature are placed on the table to be learned about, played with and enjoyed. We change our nature table every few months to reflect the season, so the items on it are added and taken away throughout the year. Learn more about our fall nature table by clicking on the link. 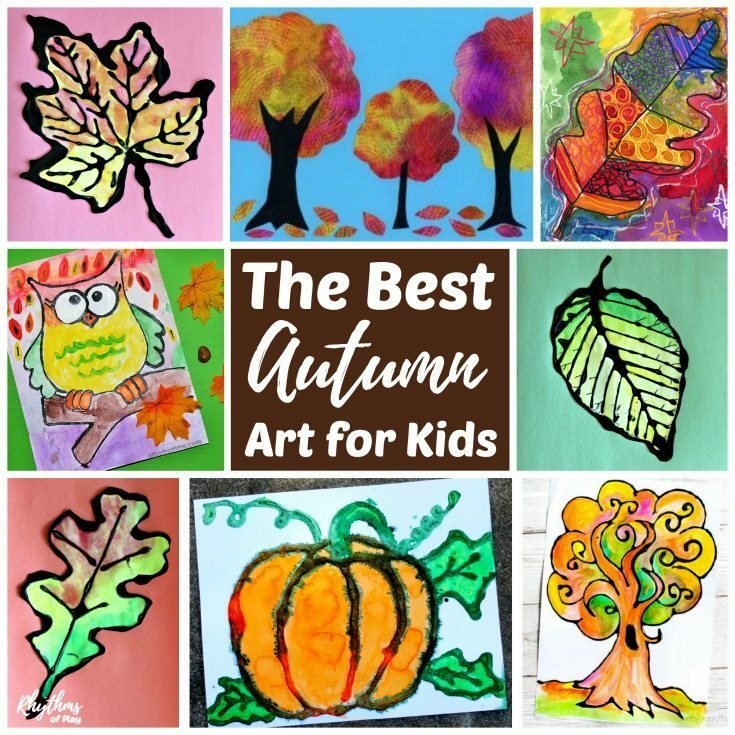 Paint with fall colors as a process art activity, paint a maple, oak, or beech autumn leaf, make a fall tree collage, or try any of these amazing fall art projects for kids! Going on a hayride is another classic fall activity for the whole family. Many times you can find a pumpkin patch with a hayride so you do both activities in one fell swoop! Check your local family resource guide or google “hayride” to find one in or near your city or town. Reading books that reflect the season is a great way to help our children learn about the natural rhythms of our planet. Check out this awesome collection of fall books for kids to see our family favorites! 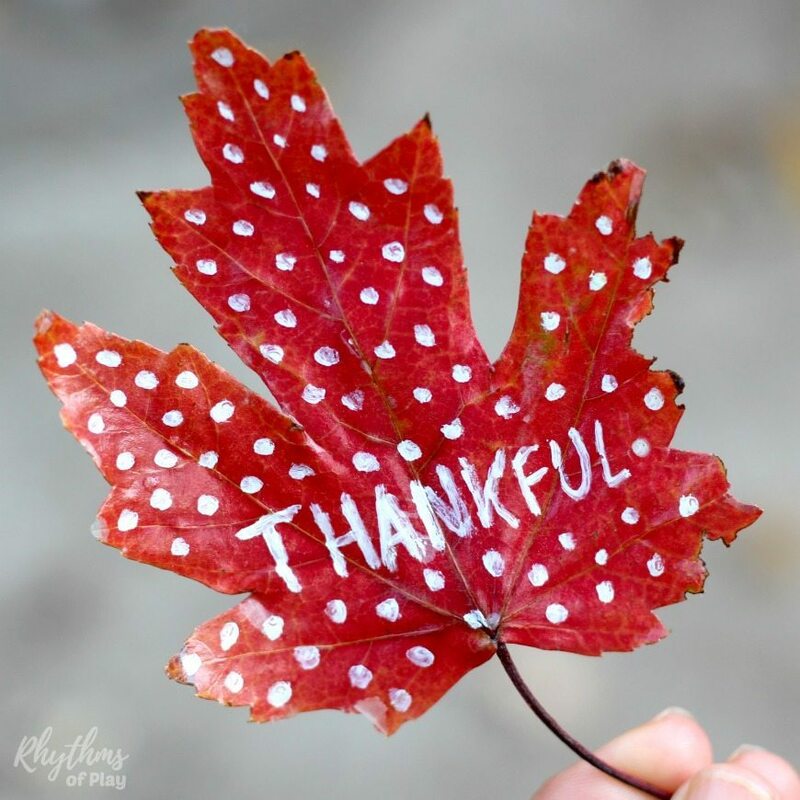 Practice gratitude in your home all year long with these gratitude activities and crafts, or check our collection of Thanksgiving gratitude activities and crafts! 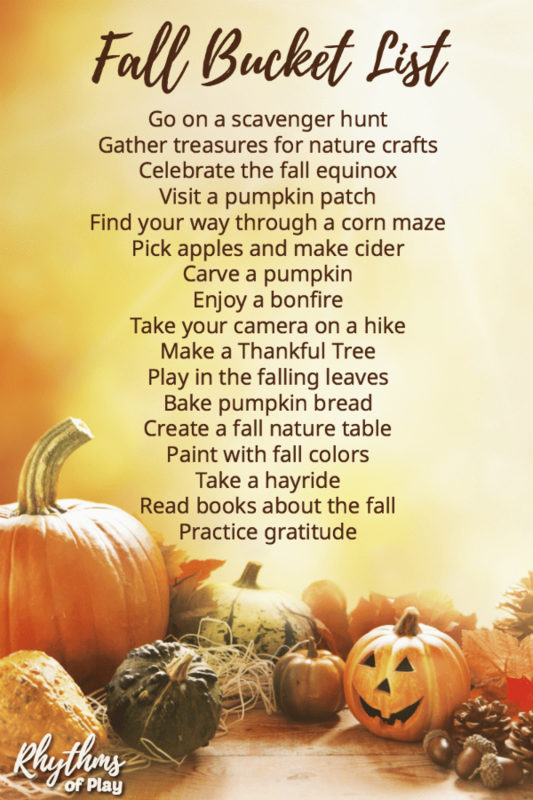 We hope this awesome collection of autumn activities helps you enjoy this magical season… Or, Make your own Fall Bucket List!! Make your own Fall Bucket List! brainstorm some of your favorite things to do as a family–don’t forget to include a few of the ideas above! Our hope for you us that the fall season will be full of joy and togetherness!